New wave California producers are striking a chord on the wine scene in the United States, and on the global stage consumers can now better appreciate their offerings. China may have been busy planting grapevines, especially those designed for table grapes, but the United States is by far the most important wine producer outside Europe. Yet to my mind we see far too few of their wines outside the United States. I suppose part of the reason is their domestic market is so huge that many US wine producers feel no need to export – unlike, for instance, their hugely export-dependent counterparts in Australia and New Zealand. There was a time, in the early 1980s, when Britain seemed awash with California wine and California wine producers. Admittedly the pound:dollar rate was extremely helpful then, but there were also government grants available to help fund overseas trips for wine exporters, too. This hardly seems likely in the Trump era of ‘America first’. Then in the 1990s and 2000s, the supply of California wine exporters and wines in Europe seemed largely to dry up – with the exception of the least interesting mass market brands that continue to have a major presence in British supermarkets. Nor did it seem as though US wine was particularly prevalent anywhere outside the United States. I would occasionally spot some well-known California names at the back of ambitious restaurant wine lists around Europe, but the vintages were suspiciously old. The wines seemed like leftovers from a previous export campaign. Practically the only producer of fine California wine that seems to have had a consistent, and successful, export policy is Ridge Vineyards. Ridge’s Paul Draper is a cosmopolitan being and a keen traveller who has taken pains to work Ridge’s many, and enthusiastic, export markets. The situation was probably exacerbated by the high prices for California wine that resulted from the strength of both local demand and the California economy. I remember one Paris restaurant wine list that cast its net unusually wide geographically (i.e. actually included some non-French wines) but listed the bottles in ascending price order, disregarding where they came from. The bottom of each list was occupied by bottles from California. I’m delighted to report, however, that after this long drought in terms of California presence on wine lists and shelves here in Europe, there seems to have been a bit of a sea change. Whereas until fairly recently California wine (which accounts for 90% of all US wine) was either very cheap or very expensive, there is now a wide range of producers keen to occupy the middle ground, offering some serious value. And, just as importantly as far as I’m selfishly concerned, quite a few serious wine importers in the UK are taking an interest in their wares. This new wave was initially represented and strengthened by a formal movement away from high-alcohol wines known as In Pursuit of Balance, and celebrated by wine writer Jon Bonné, then wine correspondent of the San Francisco Chronicle, in his 2013 book The New California Wine. It’s great to see more and more mid range wines from California – especially as so many of them offer variations from the old diet of cabernet and chardonnay exclusively. There is a great vogue among the new wave California wine producers for seeking out old plantings of relatively obscure grape varieties. So nowadays from California we’re seeing wonderful old field blends, and the likes of alicante bouschet, barbera, grenache, petite sirah, St Laurent, valdigué, malvasia, semillon, and pinot blanc – grape varieties that were long ignored by the marketplace. Many of these vines are venerable and their produce used to be blended in to wines carrying what were then more fashionable names. After all, a California chardonnay, for example, may include up to 15% of grapes other than chardonnay. Longstanding king of chardonnay David Ramey deserves special mention for his Sidebar blend from an old Russian River vineyard whose 60- to 125-year-old vines include zinfandel, alicante bouschet and petite sirah as well as traces of sangiovese, carignan, trousseau, petite bouschet, syrah, Béclan, tannat, peloursin, graciano, plavac mali, palomino, and monbadon. Bingo! Young-at-heart UK wine importers such as Roberson, Les Caves de Pyrene, Nekter, Indigo, and Flint (whose retail arm is Stannary Street) are embracing these wines that can stand against the new wave wines of rural France, Spain, Australia, and South Africa. They have a lightness of touch and transparency that contrasts markedly with the extreme ripeness we have come to associate with many a stereotypical Napa Valley cabernet. While a wind of change has been blowing through vineyards and cellars around the globe, freshening up wine styles, I don’t get the impression change has been as marked for Napa Valley cabernet. And why should it? These wines are so enviably commercially successful. And they are made in a corner of the world where wine collectors really appreciate them and have the means to afford them. The cult Napa Valley cabs may still sell the great mass of what they produce to those who slowly climb up their mailing lists in the hope of being allocated a few bottles, but here in London anyway, we have definitely been seeing more representatives of these hallowed names, whose prices rival those of Bordeaux first growths. Is it simply because London is famously the home of oligarchs and oil magnates? Or are they actually interested in selling to us more grounded wine buyers? In the last few months, visitors to London from California have included Paul Hobbs, Ray Signorello, Rosemary Cakebread representing her own impressive Gallica wines (like so many female Napa Valley vignerons she is also a winemaking consultant), David Ramey, Michael Cruse, and Jasmine Hirsch – the last two being members of the new wave. 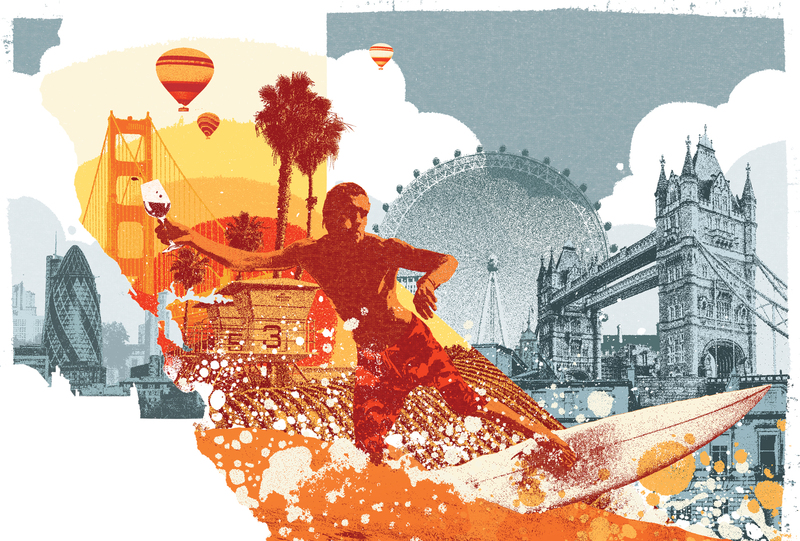 Here in Europe, we’re delighted to welcome California wine producers back to the party.